Los Angeles, CA, September 21, 2018 — OOTify, a mental wellness technology startup based in Los Angeles has partnered with Crisis Text Line to provide emergency intervention for those in need. OOTify is a social enhancement platform that matches individuals seeking support for a range of personal or professional challenges, from daily stress to anxiety or depression, with verified providers, so that they receive timely support and attention. 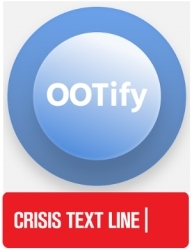 OOTify has partnered with Crisis Text Line to further assist individuals who identify their issue as “high severity.” People can engage with the mobile application or simply text “OOT” to 741741 to be connected to a trained Crisis Counselor. The OOTify–Crisis Text Line Partnership maintains the integrity of both platforms by ensuring that users have access to the appropriate level of care for their needs. OOTify focuses on leveraging technology to strengthen the mental health of college students, young professionals and new parents – because those transition periods are difficult. The solution offers a streamlined way to connect via audio, video or messaging for one-on-one sessions with Providers that millennials and gen-z feel comfortable with while empowering the Providers at the same time. To solve the mental health crisis in America, the Company has focused on creating a solution that helps both sides of the market. OOTify’s solution isn’t technology alone, though. It’s messaging and re-branding mental health too. The mental health crisis is an epidemic that requires clinicians, technologists, businesses, academic institutions, non-profits, teachers, parents – all of us – to effectuate change. Only a 360 degree approach will work and partnerships allow for compounded success for a problem that needs all hands on deck. OOTify is a mental wellness technology company based in Los Angeles. At OOTify, you can anonymously and securely engage with mental health, coaching, wellness and mindfulness professionals and mentors to overcome your issues through social enhancement. Download the app from your mobile app store, or visit The Fabric, our community forum. For more information, please email [email protected] or visit us at www.ootify.com.